We are a group of Stampin' Up! demonstrators who met through an online community and a love of swapping cards. We've been doing blog hops under a different name, but switched to My Inky Friends in June 2017. During the second weekend of every month, we hold monthly blog hops under a common theme. Now, in December 2017, we are adding a design challenge each 4th Friday of the month to showcase our creativity and help inspire others. The challenge runs for two weeks, but you are welcome to be inspired at any time. 1. Follow the general design of a sketch, although it can be flipped. 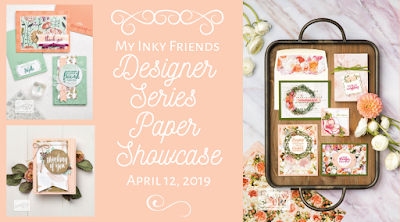 For a color challenge, Stampin' Up! colors are listed. You can use compatible colors and add neutrals as needed.2. Create something new that has not been posted before.3. Post your creation on your blog or online gallery, please provide a link back to our challenge. Provide a direct link to your project or post to the Linky. 4. 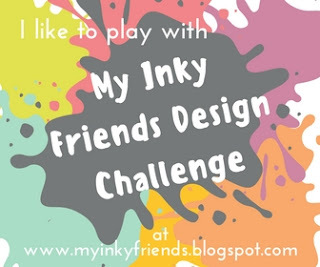 Feel free to combine with up to three challenges, as long a you include a link to the Inky Friends post.